Melt margarine in Dutch oven or large saucepan over low heat. Add onions; cook 15 minutes or until onions are golden brown and tender, stirring occasionally. Add broth, bouillon cube, Worcestershire sauce and pepper. Bring to a boil. Reduce heat; cover and simmer 20 to 25 minutes. Meanwhile, in medium bowl, combine cheeses. To serve, place 6 ovenproof bowls on cookie sheet for ease in broiling. Ladle soup into bowls. Top each with slice of toasted bread; sprinkle each with about 2 tablespoons cheese mixture. Broil about 3 to 5 inches from heat for 1 to 3 minutes or until cheese is bubbly. 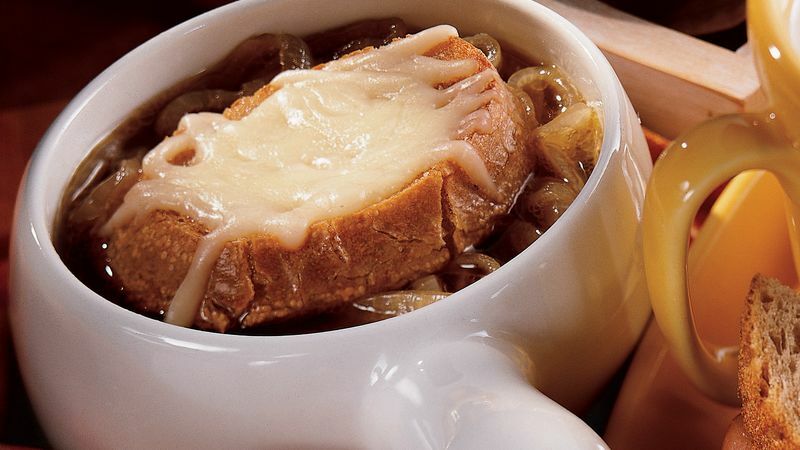 Rich onion soup made with beef broth and topped with melted cheese is a traditional after-theater late-night snack in French bistros. Gratinée is a French cooking term referring to a topping of cheese, or bread crumbs and butter, that is browned in the oven or under the broiler until crispy. The crispy surface is considered the best part, and shallow ovenproof dishes made especially for gratins allow for a generous amount of the topping. For a richer flavor, substitute 1/2 cup dry white wine or sherry for 1/2 cup of the broth. To save preparation time, use a food processor to slice the onions for this soup.